In recent years, it’s safe to say that the finance industry hasn’t emerged with the best reputation for corporate stewardship. While the news stories may have temporarily tarnished some images, the corporate sustainability officers have toiled selflessly in the background to improve financial performance, stay ahead of regulations, and lessen the environmental impact of operations. Energy efficiency has become a core element of many financial institutions’ sustainability programs. Once reluctant to pursue these programs, banks are realizing that such actions won’t just improve their financial performance but earn goodwill in the communities they serve while protecting the environment- building much needed social capital. Energy consumption, carbon emissions, and rapidly rising costs from digitization are all contributing to the renewed focus. In fact, a recent Carbon Disclosure Project (CDP) survey of 1000 top executives inquired about views on the impact of sustainability and business. The results were surprising. A full 100 percent of bank CEOs believe that sustainability is either “important” or “very important” to the success of their business. Many financial institutions have used sustainability as a strategic advantage to gain visibility as good corporate citizens and boost investor confidence. Indices like the Dow Jones Sustainability Index which looks at the performance of the largest 2500 companies based on their economic, social and environmental plans or awards for sustainability run by publications or organizations such as The Guardian’s Sustainable Business Awards or the ASEAN Corporate Sustainability Summit Awards can contribute a great deal to changing market perceptions. Step 1: Define the strategy — Invest the time and resources required to define an actionable strategy that has the appropriate, high-­level executive buy-­in and commitment. 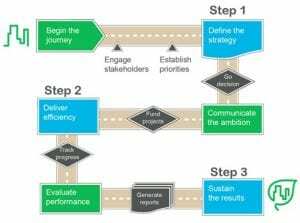 Step 2: Deliver efficiency — Codify and resource the strategy as a corporate program where potential energy efficiency projects are prioritized and funded, and execution plans are developed to deliver efficiency improvements. Step 3: Sustain the results — Make programs and projects a part of the broader corporate focus on continuous improvement to sustain the initial results and to provide new inputs and ideas for additional energy and carbon reductions. In order to maintain results and improve sustainability and energy management over the long term, the above process should be recognized by stakeholders as ongoing- not a one and done. Sometimes, knowledgeable consultants can be brought in to provide an outside perspective and to provide structure to the program with step-by-step detailed strategy and execution plans aligned to organizational goals. When reputations are at stake and regulatory compliance is being scrutinized more than ever, it’s important for financial services companies to participate in energy and sustainability management programs. The results can help improve margins, increase customer loyalty and employee engagement, and reduce an organization’s overall resources consumption. Not only that, a well-executed and promoted program may even help re-build trust with the communities and investors served. For more information about Schneider Electric’s solutions for finance, visit our finance solutions page. Better together: corporate sustainability and energy management programs Use energy management to power your corporate sustainability program Finance sector gets serious about energy efficiency, sustainability How can a financial firm make gains from a sustainable energy program?